Kentucky Equality Federation President Joshua Koch extends a welcome to Kentucky Equality Federation's new Board members, in addition to new Board leadership. President Koch also welcomed attorney Jillian Hall as Kentucky Equality Federation's Legal Director and its Allies Community Outreach Director. "We are absolutely excited at the new group of leaders who have risen to the challenge," Koch said. "We are constantly moving forward, and this election is vital to shaping our strategy going forward. This team's recent sacrifices and capacity to seize the initiative portends great things for Kentucky Equality Federation and the Kentucky equality movement." This brings Kentucky Equality Federation's total Board members to its maximum of ten (10) per new Bylaws approved by the official membership. All previous Board members remain part of the Board of Directors per Kentucky Equality Federation's rotating Board election schedule, including founder Jordan Palmer. Kentucky Equality Federation's Interim Committee for Official Membership did retire several Board members prior to new elections being held. Official membership typically meets once a year to elect the Board of Directors and the President. Between these times the interim committee handles most items with unlimited authority. The Board elects its own non-executive Chair (sometimes legally referred to as the Board President), Treasurer, Secretary of the Corporation, and other Board leadership. 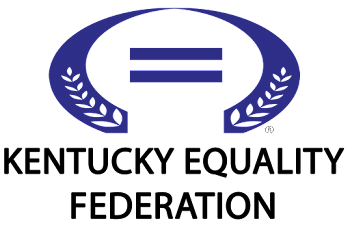 Administration consists of the president, officers appointed by the president, all regional directors, outreach directors, and all other volunteers and interns appointed by the president as the chief executive officer of Kentucky Equality Federation and its affiliates. 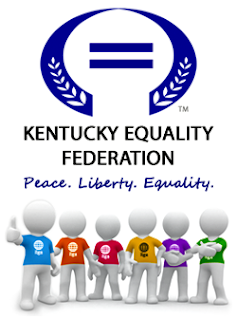 Former Kentucky Equality Federation President Jordan Palmer, the Board of Directors, and Membership made sweeping changes several years ago to get Board members out of day-to-day operations and make the Board an oversight and legislative body for Kentucky Equality Federation and its affiliates. This included extensive changes to Bylaws which only official membership or the Interim Committee for Official Membership may change. At the time, former Chairman Richard T. Jones and Secretary Dean Byrd also called the changes necessary. Former President Jordan Palmer called the changes "a must" to make the Board of Directors "a truly independent and oversight board; management can justify any action so long as management also makes the sum of board members. Without an independent body supervising management, management has complete authority to run amok without answering to anyone. Without an independent Board you effectively have a "clique," that can do or say anything without consequences. A key attribute of an effective board is that it is comprised of a majority of independent outsiders; a board with a majority of insiders is often viewed as being stacked with sycophants, especially in cases where the executive and the chair are the same person." In 2011 Palmer also pointed out: "Most non-profits and private companies now have or are seeking independent boards. Most now require that a minimum of two-thirds be independent. Having a chair and a president who are one in the same is toxic to any corporation, non-profit or for-profit. I am proud of the changes we have instituted at Kentucky Equality Federation and our affiliates."